For bespoke surveys we will fully brand the report both the survey and your report with company logo and colour scheme to ensure that the individual receives a fully integrated experience. In addition to or as an alternative to the bar graphs provided in the overview section of our standard reports we provide spider plots to for the comparison of the top level data for each competency. 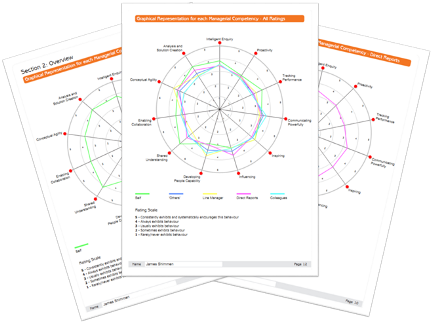 These provide a different way of viewing the data and allow you to compare all competencies on a single graph and easily identify strengths and development areas. Personal development should be a continuous process and a follow up or annual 360 survey is a great way to measure the success of the changes you have made since the previous survey. In order to make comparing the data easy we can include the previous survey data in the report to allow for instant comparison of past present data. Cant see what you are looking for or have an idea for something different? We like to get creative and are happy to work with you to find new ways of displaying data in innovative and usefuls ways. Give us a call to talk through what you would like and we'll be happy to work with you to make it happen.